International Journal of Computer and Information Technologies (IJOCIT) invites scientist, researchers, PhD scholars and all academicians from all over the world from different domains to submit articles. This journal includes computer science and Information technology in general, electronic and communication engineering, Social and management Science, intelligent systems and business intelligence and many others. 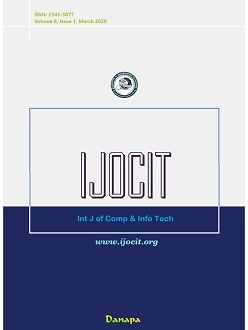 IJOCIT journal aims to publish high quality theoretical or empirical research articles, case studies, review papers, research proposals, case studies, surveys, tutorials as well as pedagogical and curricular issues. All authors are invited to submit a full paper for consideration. All accepted papers are published online and in printed form. All the accepted papers of the journal will be processed for indexing into different citation databases that track citation frequency/data for each paper. Our goal to create a new journal is publishing researches with new and interesting topics in the journal. Another of our goals is to increase scientific productivity in the fields of Information technology and computer science research. All research articles submitted to IJOCIT should be original in nature, never previously published in any journal or presented in a conference or undergoing such process across the globe. All the submissions will be peer- reviewed by the panel of experts associated with particular field. Submitted papers should meet the internationally accepted criteria and manuscripts should follow the style of the journal for the purpose of both reviewing and editing. Further, IJOCIT providing downloadable full text articles free of cost perpetually, to encourage research across the world, especially in low and middle income countries. Original Research: Only original and previously unpublished manuscripts will be accepted for publication. Upon acceptance of your manuscript, IJOCIT editors will forward a warranty agreement that requires confirmation that the manuscript is original and has not been submitted for potential publication or previously published elsewhere. All copyrights, including translation of the published material into other languages, are reserved by the publisher, IJOCIT. Upon transfer of the copyright to the publisher, no part of the manuscript may be reproduced in any form without written permission of the publisher. Reviews Paper: Submissions of reviews and perspectives covering topics of current interest are welcome and encouraged. Reviews should be concise and no longer than 4-6 printed pages (about 12 to 18 manuscript pages). Reviews manuscripts are also peer-reviewed. Case Report: Authors are encouraged to submit articles on case report using precise scientific topics, with excellent details, investigations and curiosity. Short Paper: A Short Communication is not more than 5 printed pages in length. Authors should submit a suitable manuscript with unique research methods, records, models and pioneering results. Short-papers are limited to a maximum of two figures and one table. (1) Abstracts are limited to 100 words; (2) instead of a separate Materials and Methods section, experimental procedures may be incorporated into Figure Legends and Table footnotes; (3) Results and Discussion should be combined into a single section. Publication and Peer-Review Process: All manuscripts are reviewed by the Editorial Board and qualified reviewers. Decisions will be made as rapidly as possible.The editorial board will re-review manuscripts that are accepted pending revision. It is the goal of the journal to publish manuscripts ASAP after submission. All the submitted paper should be follow on IJOCIT -Papers-Format. Please Download Word Format-Template of IJOCIT Papers.